Break the United States into manageable parts after shoving Americans' noses into utter destitution, allowing millions of Mexicans to invade, inciting chaos, class warfare, and forcing a war using mercenaries against its citizens - that is Obama's plan for this country. 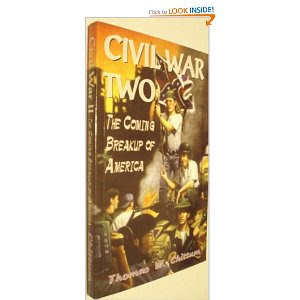 I am Thomas W. Chittum, the author of the book, Civil War Two – The Coming Breakup of America. My book asserted that because America is a multiethnic empire it will experience a violent shattering along tribal lines just as other such empires have throughout history. I further predicted that this implosion will occur relatively soon, probably no later than the year 2020, based on ongoing demographic trends. 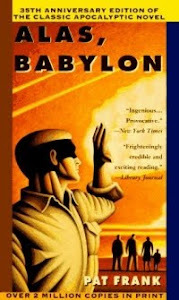 My book was published in 1993 and it ignited a mini firestorm of controversy. To date, it is still the ONLY non-fiction book on the topic of a civil war here in America. Did anyone write a book predicting our first civil war? I did some research on that subject and I was unable to find a single book warning Americans that they were fast approaching an abyss. That’s not to say that people were unaware of the approaching war. In fact, many people were perfectly aware that a civil war was inevitable. 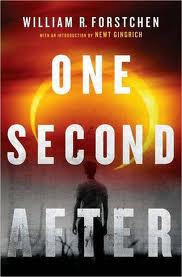 My guess is that not a single person wrote a book on the coming war because they thought it would be a sort of picnic with a little gunfire mixed in, and in any case it would be over in a few months. As history records the war ground the entire southern half of America into a smoking wasteland and killed or crippled almost an entire generation of American men. Today, people are even less aware of the seriousness of the approaching calamity than our ancestors were. If you mention the possibility of a Yugoslav-style ethnic war here in America in our lifetime most people will scoff at the idea. Five years ago most people would have likewise scoffed at the prospect of a second depression. Now, most people are waking up to the horrid fact that a second depression is upon us – that their retirement cookie jars have been systematically looted. I’m sure that most visitors to the Rumor Mill News site are perfectly aware that a devastating depression is unfolding and that the economy is in a crash and burn mode with no plausible salvation in site. In this and following rants I will attempt to make the case that this economic meltdown will hasten our descent into an internal civil war that will depopulate the entire North American continent, wiping out 50% or more of the population. No, I’m not kidding. I’m going to say that again – most of you people reading these words right now are going to starve to death in the tribal wars that will follow close on the heels of the economic meltdown. Before I go on I’d like to revisit my book and go over what I got right and what I got wrong. I mentioned the New World Order in my book. At the time I wasn’t aware that the New World Order was an active conspiracy of bankers and aristocrats centered in London. I thought it was a sort of lose alliance of giddy globalists, trendy tree huggers and politically correct airheads. Then along came both the internet and the 911 terrorists attacks. I took me approximately three months to wise up to the fact that 911 was an inside job. I’d always followed military events closely and that’s how I woke up to the 911 scam. For years the American military had been encircling Afghanistan with military bases and pre-positioned stockpiles of military goodies. Then along came Osama bin Subcontractor like some boogie man in a bad movie. It all seemed like a low-budget Hollywood production. That’s because it was. So … I got on the internet and started listening to commentators like Eustace Mullins, John Coleman, Henry Makow, Charles Savoie and anybody else who didn’t depend on the establishment for their supper. Even before 911 I knew from personal experience that nothing in this rotting empire was as it was spray painted by the establishment media. After my book was published I got my 15 minutes of fame. I was on Television. I was a guest on numerous radio shows. I was a guest speaker at a lot of political meetings. I met a lot leaders of (mostly) right-wing type extremist groups. I remember telling one rightist-type leader that my presence as a speaker at their meeting did not mean that I was endorsing his organization or its stated goals. I told him I’d gladly speak to a “roomful of Rabbis” if they would invite me. I made it plain to everybody that I was pretty much a one-trick pony. My self-assigned task was simply explaining to people why we were headed for a Yugoslav-style civil war and in our lifetime. I wanted to explain this to every living American, and I didn’t care two cents what their own political beliefs were. I made no apologizes then for speaking to right-wing extremists and I make no apologies now. After a while I began to realize that something really strange was going on inside the so-called extremist right-wing groups. At every meeting there were always one or two dudes who just didn’t fit in. My favorite was a investment banker and Yale graduate. What, I wondered, was a blue-blood Yale investment banker doing mixing it up with all these guys who drove pickup trucks draped with confederate flags. Mind you, I wasn’t totally naive. I knew that the FBI and/or the CIA routinely sent guys to monitor these groups. Frankly, I didn’t give a damn. As far as I was concerned the more people that listened to me the more I liked it. Nazis, rabbis, government spooks, good-ole-boys in pickup trucks – I didn’t care – the more the merrier because my warning was for everybody. Ultimately, it dawned on me that these obvious government spooks weren’t there to spy on these groups – these government spooks were there because THESE GOVERNMENT SPOOKS WERE ACTUALLY RUNNING THESE RIGHTIST GROUPS. Most of these right-wing groups were conceived, planned, created and then run by government spooks. It’s all part of what I call peasant management. The powers that be know full well that their policies will always generate opposition both leftist and rightist … so … they create and subsidize false flag opposition movements that they can lead around in eternal circles thus creating no real problems for the establishment. And don’t forget that it’s the same exact scam with the phony baloney leftist groups. They are mostly establishment creations. In fact, it’s a double payoff for the establishment. They create false flag rightist groups to stampede leftists into the ranks of their false flag leftist groups, and they create the false flag leftist groups to stampede rightists into their false flag rightist groups. The New World Order is in a hell of a jam. Both Russia and China have how shaken off communism which was imposed on them by the London Banking Cartel. Both have turned to state-directed development and growth policies and are striving to feed their people and increase their standard of living. This is the exact opposite of the global depopulation and genocide via starvation and war that the New World Order is imposing on the rest of the globe via the Club of Rome and their other psychotic think tanks and NGOs. Russia and China and some neighboring states have formed a double whammy military and economic bloc called the Shanghai Cooperation Organization. The London Banking Cartel cannot let this situation continue or it’s just a matter of time until the Russian/China economic bloc takes their place. Furthermore, it has long been the military doctrine of the London Banking Cartel that the Eurasian landmass is the key to the military control of the globe. See Halford Mackinder. From the perspective of the London Banking Cartel it’s all or nothing and here and now. The clock is ticking against the London Banking Cartel and the only solution to fulfilling both their military and economic blueprints is pedal to the metal all-out war. It isn’t like the good old days when a handful of Zionist assassins in communist clothing could overthrow a decadent Russian government, and the tiny British fleet and army can no longer kick a decadent Chinese oligarchy around and impose imported communism. Nothing but all-out war will suffice, and that means nuke warfare. The only card the London Banking Cartel has to play is the American nuclear arsenal. They have to get America into a nuclear shootout with both Russia and China, and the sooner the better. Now I know what some of you are thinking: But golly, don’t these guys realize that a nuclear war will leave the planet a radioactive wasteland? Now hear this: The nutcase LBC boys perceive nuclear warfare as winnable and survivable. In any case that’s the ONLY card they have left to play. It didn’t get much play in the national media, but VP Cheney has been digging his personal nuke bunker in DC deeper and deeper like a beaver on go pills. He’s getting ready for it … and so should you. The LBC has to sell global war to the American airheads, hence the 911 terrorist attacks. Dictatorships cannot stampede the people into giving up their property and their liberty without conjuring up both foreign AND DOMESTIC ENEMIES. That’s why a civil war is in the offing. A civil war in America is not only possible – IT IS ESSENTIAL. It’s all part of the plan. Flood the Southwest with millions of Mexicans and then trash the economy so the starving and ticked off Mexicans will burn an entire geographic region right down to the ground. This should be sufficient to stampede the rest of the peasants into accepting anything the LBC pukes up and presents as a solution to the resulting mess. To understand their logic we’ll have to take a quickie refresher course in the history of Western war. Napoleon resurrected the concept of the citizen soldier that had been doormat since the Roman Republic. He was thus able to raise massive armies of peasants who perceived themselves as citizen soldiers. Deluded as they were they nevertheless simply swept aside smaller armies of professional soldiers. The ONLY military reply his opponents could make was to raise massive armies of their own so-called citizen soldiers. Under the new military system large populations were an absolute military necessity. The increasing mechanization of warfare didn’t change the situation at all. Massive peasant armies were still required because hordes of deluded peasants were still needed to drive the trucks and armored vehicles that delivered themselves to the slaughterhouse. There existed a rough balance between the quantity of military supplies an industrial society could churn out and the quantity of “citizen soldiers” needed to transport and then use the supplies at the front. Massive quantities of peasants were necessary for both production and subsequent usage at the front. The pendulum didn’t begin to swing back the other way until the arrival of nukes on the scene. Massive peasant armies were no longer a necessity due to the extreme energy density of nukes. The industrial infrastructure necessary to generate a really impressive nuke arsenal was far greater than the relatively small number of professional soldiers (read airforce) necessary to deliver them. When peasants became useless for war the bulk of them became useless. Before nukes the rule was the more peasants the better. After nukes only a smaller number of peasants were needed to produce goodies for the idle aristocrats. Today, massive peasant armies are obsolete and are maintained chiefly on a reduced scale for theatrical purposes. They are there for peasant perception control purposes exactly as are the false flag leftist and rightist mock opposition groups I mentioned earlier. Ordinary infantry such as our current army and marine divisions are obsolete. Ordinary infantry are useful only for fighting other likewise obsolete infantry, and for suppressing uprisings of lightly armed domestic peasants … and for pure theatre. Now that you understand this point I can get back to America via a short detour through the Middle East. The primary objective of our current insane activities in Asia is the conquest of the Asian heartland. A secondary but also necessary objective is the total destruction of our current and obsolete military machine to transform it into one more useful to insure the destruction and dismantling of the American Republic. Russia and China have both slipped the grasp of the London Banking Cartel and they dare not risk America going the same route, hence their stealth plot to carve up America like pizza into manageable mini-states. The destruction of the American military in Iraq and Afghanistan will pave the way for its replacement by privatized military contractors formerly known as warlords. Citizen soldiers might balk at massive ethnic cleansing operations in California for example, but warlords won’t. Picture armies of Blackwater mercs composed of mostly non-Americans recruited from all points of the globe. They will gladly slaughter everything in their path including any remaining American military units who might oppose them. The LBC must first ignite a civil war in America and then ultimately ensure the that the secessionist win after their hired warlords and mercenary hordes have stomped the new mini states into malleable mush which may or may not be glued together in some sort of North American Confederation with “Ameros” for money and some multi-colored rag for a flag. I basically think it will work. I think the coming tribal/civil war in America will be roughly proportional to the severity of the economic collapse that sets it off. Meanwhile, while you are waiting for Osama bin Subcontractor to nuke us and waiting for your starving neighbors to batter your door down, keep an eye on California. It’s the canary in the coal mine. When it croaks the rest of America will follow sooner or later. Blogger's thoughts: Obama has already graduated the first class of graduates for his "domestic military" and they are black, inner-city youth. 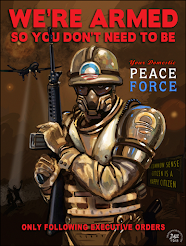 Obama will exploit the race of his new army to incite riots and provoke civil war.